On the 40th anniversary of the assassination of Robert Kennedy, I would like to again share what I still believe is the greatest impromptu speech in American political history. The speech begins after you hear Kennedy asking an aide if the crowd knows that King has been killed. 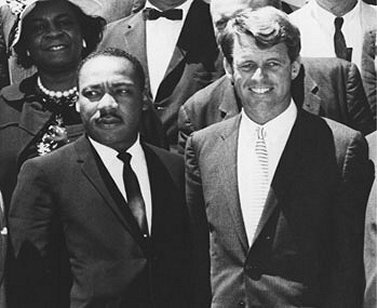 By now, RFK’s speech in Indianapolis on April 4, 1968 — the night Martin Luther King Jr. was murdered — is the stuff of legend. Books and articles have parsed it and honored it and even shown that his beautiful quote from Aeschylus might have been slightly inaccurate. No matter. I will never tire of hearing it. Almost exactly two months later, Robert Kennedy was killed at the Ambassador Hotel in Los Angeles. I was one of thousands of anonymous witnesses to these horrible events in LA. In fact, a year ago I was stunned to see that Evan Thomas’s wonderful RFK, Jr. biography includes a photo in which I can be seen, along with hundreds of others, clinging to the car in which Kennedy was campaigning in El Monte, California. I was actually there as a volunteer for the campaign of Kennedy’s opponent, Senator Eugene McCarthy. But as RFK’s convertible approached, I was lost in the frenzy. Two days later, it was over. This is the quote from Aeschylus that Kennedy spoke in Indianapolis on the night of April 4, 1968. Next Next post: You Wanna Talk Cool? Check Out Antonio Machin.